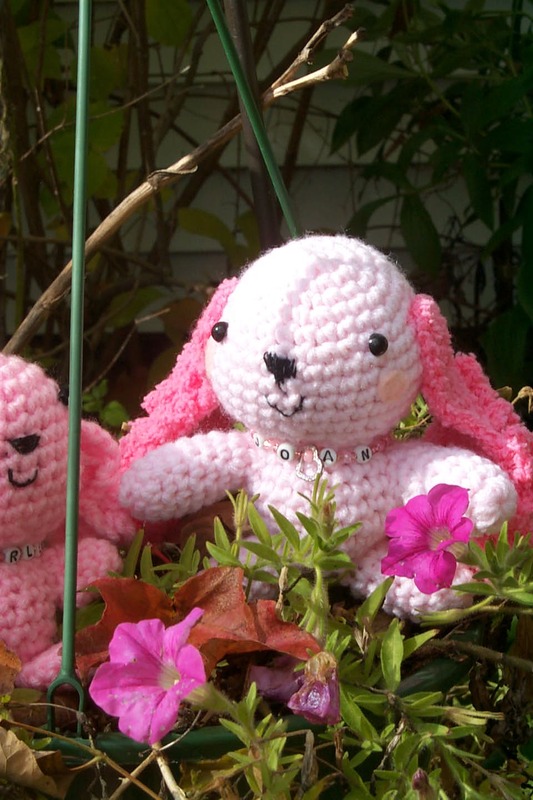 AmiDoll Buddy In The Pink–The Pattern–Plus! Bling in the Pink with a Purpose! 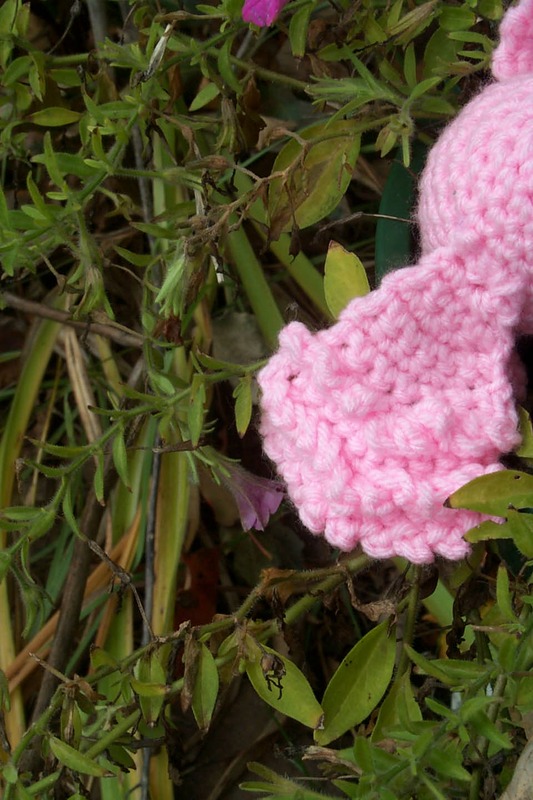 And heeeerrrreee she is– AmiDoll Buddy In The Pink–the pattern. 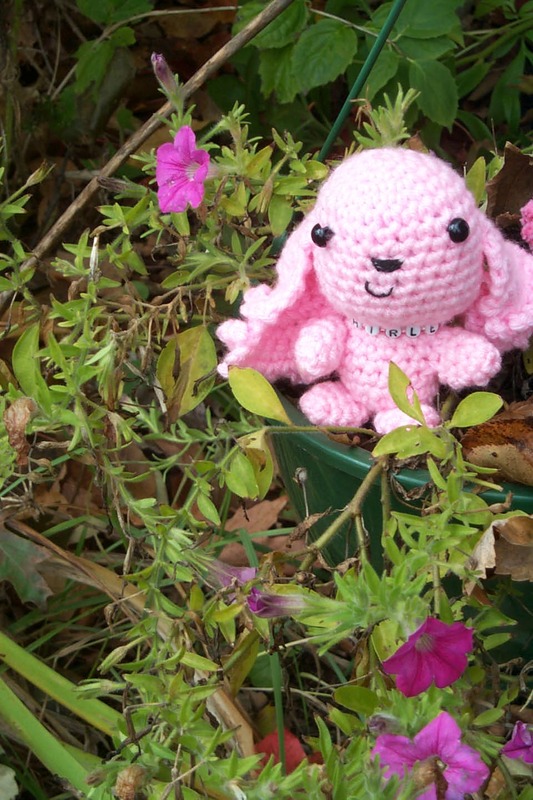 Now you can make your own AmiDoll Buddy In the Pink champion for breast cancer prevention and awareness. October is breast cancer awareness month. Make this little Cocker Spaniel amigurimi doll complete with a jewel collar with the name of your champion person to remind them to have routine health screenings. There’s also a pattern for a stretchy beaded bracelet you make for yourself or to give away as a sparkly reminder when AmiDoll Buddy cannot be with you. Bling for a pretty in pink purpose! Cocker Spaniels are bred to find wild birds and bring them to their owners. Our AmiDoll Buddy is flushing home good health for you and your loved ones. Sewing needle small enough to go through beads. Pink and white crystal beads. R1 Ch 2. 6 sc in second chain from the hook. Place safety pin marker at the start of the row. R5 -11 Sc in each of the 24 sc. Next create face. Attach eyes and embroider mouth and nose. Align nose feature nearly level with eyes and place eyes wide. Satin stitch sew the nose (see photo).Embroider mouth with three strands black embroidery thread. End off and stuff body. Sew to head. Use E hook, ch 2. R2 -3 Sc in each sc. End and sew to the body. R1 Sc in each chain. ch 1 turn. R5 Sc across to end, ch 1, turn. R6 Sc next 2 sc, 3 sc in the next sc and then sc to end, ch 1, turn. R7 Sc next 3 sc, 3 sc in next sc, sc to end. Ch. 1, turn. R10 Sk first sc, sl st next sc, sc to end, sl st last stitch. DO NOT FASTEN OFF. With yarn still attached, chain 3 and working along the lower edge of the ear, slip stitch, chain 3, slip stitch in each of the stitches (9). Ch. 3, turn. Working in each row, for three rows from the bottom of the ear, chain 3 and slip stitch across the row. Measure a 6 inch beading thread (can use 3 strands of white embroidery floss). Be sure your needle will go through the beads you’ve selected. Layout the bead pattern, for instance, small white or pearl-like bead, pink crystal bead, small white, letter bead, small white, letter, white, letter. After the last letter continue with small white, pink crystal and small white until you have 4 inches of beaded collar. Once you have it strung, fit it around your AmiDoll’s neck and double knot to secure. 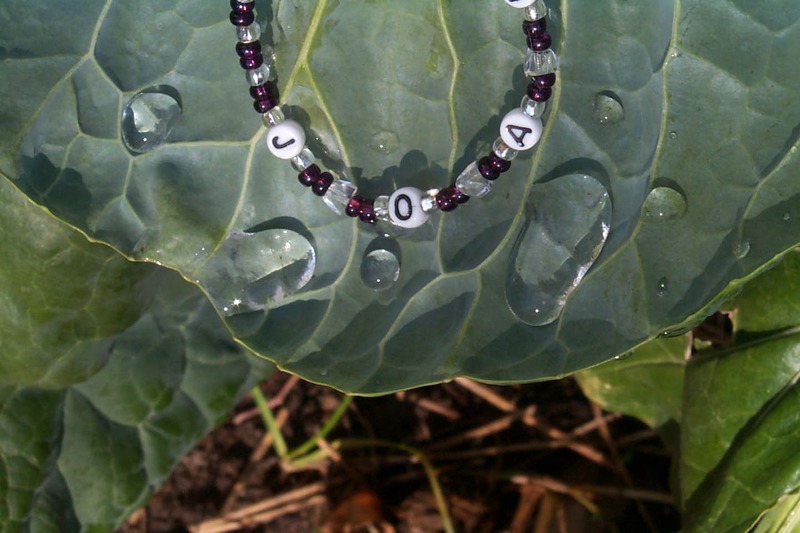 Distribute the beads so the letter beads are to the front with the name of the “champion” it is dedicated to. If you like, you can use other decorations on the collar. Just be sure they are proportionate to your AmiDoll. 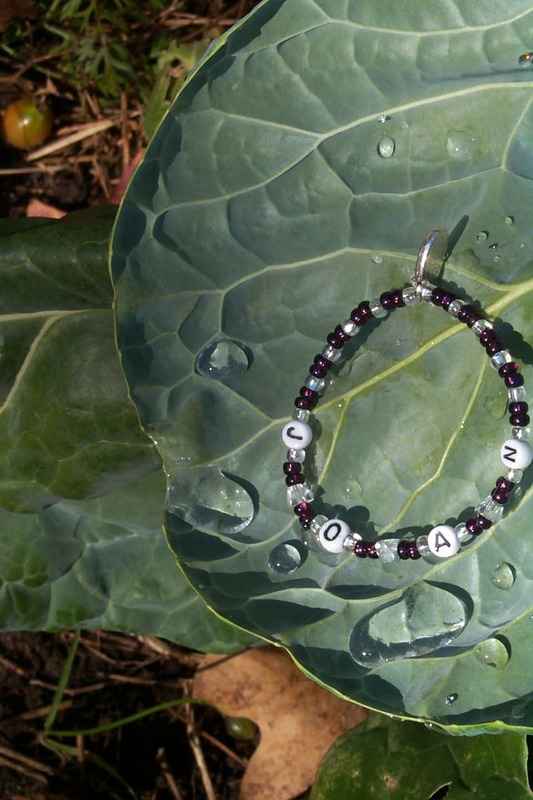 To make a matching bracelet for yourself or your Champion people use stretch cord and crystal and letter beads to match your AmiDoll Buddy’s collar. Give them to your Champion with the AmiDoll Buddy so they remember the importance of early detection of breast cancer and as a tribute to all women. When finished slip the bracelet over your wrist to wear. Make and wear one for each person you give an AmiDoll Buddy In The Pink to. Use inexpensive yarns or scraps. Use paper and pencil to track rows and counts. Use a safety pin or clip stitch marker to note start of next row. Be careful to keep the right side out as you work the pieces. You may not use this pattern or the product produced from this pattern for retail or commercial purpose.